A year ago today, I said in my retrospective of 2005 that that year had "went all over the map, and sometimes drove straight off of it." If that's the case, then 2006 not only went off the map, it mutilated it before burning what was left. I've been looking over all the posts made during this past year and it's really something: you can actually see me changing as a person, almost right before your very eyes, across this past year. A lot of things that I wrote a year ago, I doubt if I would have written those things today. But they're going to stay up: I don't believe in tailoring the past to accommodate convenience in the present. Whatever flaws I've revealed in myself as a person with this blog are staying put... because I've enough confidence that God is going to let me surpass them. Speaking of which, I think the biggest thing I learned this past year is to put my faith in God as much as I can, and to trust where He's leading... because what He has in store for us is always a lot better and more interesting than anything we could do on our own. I didn't write about this at the time but I will now: toward the end of this past January, I lost a job that I was really enjoying. I still don't understand fully why that happened. And it did devastate me for awhile... but only for awhile. I let it bring me down only so much and then I said "okay, God, where do You want me? I leave it all up to You. I'm tired of leaning on my own understanding anymore. From now on You put me where You want me to be according to Your will, not my own." Well, what happened after that, I can only call a miracle. I got a better job, one that I enjoy even more than I did the last one. We were able to move to a better place. A lot of good things started happening. And then like a bolt out of the blue, without me ever intending to do it at all, I wound up running for school board... and did amazingly well when the votes came in, all things considered. 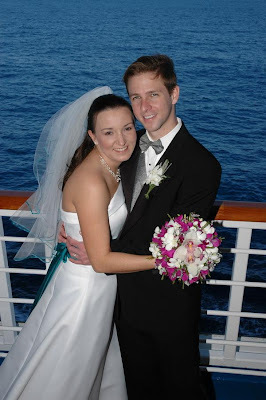 I started 2006 with some hope and optimism. That was wrong. I was putting too much faith in myself. And God brought me down for it in short order. But when I started putting my faith in Him, He began doing amazing things. So I'm not going to make any boasts about this coming year. Except that I do want to rely on God's will and His grace more than I ever have before in my life. What else can be said of 2006? Lisa and I made some great new friendships (we are really looking forward to visiting Jenna Olwin sometime this coming year 'cuz she has become not just a terrific friend but an amazing sister in the Lord). We re-kindled some old ones. We traveled a bit... and speaking of which, in 2006 I finally got to do something that I'd wanted to do for almost fifteen years. I made a short film that a lot of people seem to have thought was funny. Then I went completely over the top and made a schoolhouse explode in one of my campaign ads. We got to see some friends get married. On at least one occasion I looked into the face of pure evil. I saw a lot of movies and reviewed them here: some good and some outright stinkers. Whichever way you cut it, this past year was a little bit of everything. And I'm trying hard not to look forward to 2007. Just want to accept whatever God brings in His time. I've no doubt that it will be something wonderful. This was the perfect movie to go out of 2006 with. I haven't felt this good coming out of a movie in, Lord only knows how long. No film in recent memory had me coming out of the theater feeling so upbeat and hopeful and affirmed with life as Rocky Balboa has. I saw it yesterday afternoon at the Grande in Greensboro and... it's just resonating with me on so many levels. It'll probably be days before I can really feel like I've completely taken it in. I'm glad that Rocky V was made now. There were some things that I liked about that movie but it had problems: too many to justify it being the final chapter of the Rocky saga. Sixteen years later there is at last a sense of proper closure for this story. If there had been no Rocky V, there would have probably been no Rocky Balboa to go out on such a high note. You are no doubt reading in a lot of other places that Rocky Balboa is a terrific "bookend" to the tale of Rocky Balboa, complementing the original Rocky from 1976. That is a great description of this movie. In fact, I would recommend watching Rocky before going in to see Rocky Balboa. You don't need to see any of the sequels (except maybe Rocky II). You just really need to know how Rocky got started, to appreciate all the little nuances to be found in this last round of the Italian Stallion's career. For instance, Rocky still has the two pet turtles that he had in the original movie thirty years ago. All the familiar places, like Rocky's old apartment and the meat-packing plant, are still there... though time has obviously taken its toll, as Rocky laments to Paulie while looking at the fading sign on Mickey's gym. Meanwhile, we find out what's become of Rocky (Sylvester Stallone). The Italian Stallion is pushing 60, and his life is now bereft of the two things that most defined him: boxing, and Adrian. His beloved wife died three years earlier and he just can't let go of her. But he makes do as best as he can, occupying his time with running his restaurant – which he named Adrian's – and sharing stories about his days of boxing Clubber Lang and the other contenders. Rocky also has a relationship – albeit somewhat strained – with his son Robert (Milo Ventimiglia), who feels that he'll never escape from his father's shadow. And as always, Rocky has brother-in-law and best friend Paulie, as Burt Young returns to the role that it just wouldn't be a Rocky movie without. Two boxers: one at the top of his game but with nothing to satiate his hunger to prove himself, the other past his prime... but feeling something within – Rocky calls it "the beast" – that won't leave him alone. Then one night, ESPN does a computer simulation – or as Paulie puts it "the fake Looney Tunes fight" – between past and present boxers: in this case, Rocky and Dixon. The computer has Rocky beating Dixon. And almost immediately, the catalyst is at work that will drive these two toward confrontation. Rumors start flying and tongues begin wagging across the boxing world. That Rocky applies for his boxing license does nothing to stem the avalanche of interest in a real Rocky/Dixon bout. And that's part of the heartmeat of what Rocky Balboa is. This isn't a movie about getting older and facing one's mortality, no matter what the press and hype might say. This is a movie about meeting life, however it is that you find life or where it is along its path that you are, and making the most of it. I have to wonder if Rocky even really thinks of his returning to the ring as a matter of age: this is something he has to do. And whatever good might be at the end of his quest, he wants to share with the people closest to him. That's a heckuva great outlook on life no matter how young or old you are. Personally, along with his original portrayal of the role in Rocky, I think this may be Sylvester Stallone's finest performance ever. It would be great to see him get some Oscar nods for this. Mason "The Line" Dixon is the most believable opponent that Rocky has had since Apollo Creed in the first two chapters of the saga. Clubber Lang and Ivan Drago were for the most part cartoon characters... but given how those two were definitely products of the Eighties – a time when EVERYONE was a cartoon character – that's pretty apropos in retrospect. 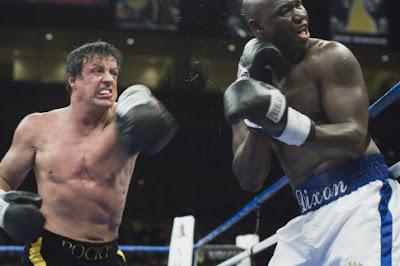 I really liked how Antonio Tarver handled the role. Burt Young as Paulie: he made me smile every time he was on screen. Paulie was always one of my favorite characters in the Rocky movies. I couldn't help but laugh out loud when I saw him wearing the GoldenPalace.com hat to the match: that's just like Paulie, to probably sell ad space on his head for ten grand. The fight cinematography in Rocky Balboa might be the best of the entire series. A lot of techniques that weren't available at the time of the earlier chapters are used here, including some great use of color-pass. I had thought for awhile that maybe for consistency's sake that some of the same style of cinematography that was used in the first Rocky movies would be used here, but that is not the case: this is a Rocky movie for the 21st Century, and that's a good thing. So many good quotes coming out of Rocky Balboa. Like Rocky's speech about "the beast" within and how it needs a release, and his impassioned speech before the boxing commission as he's trying to secure his boxing license again. That great delivery by Rocky's trainer Duke (a very welcome return by Tony Burton, who along with Stallone and Young is the only actor to appear in all six Rocky movies) about how Rocky is going to have to compensate for his age by delivering "blunt force trauma... let's start building some hurtin' bombs!" "Let me tell you something you already know. The world ain't all sunshine and rainbows. It's a very mean, and nasty place an' no matter how tough you think you are, it'll always beat you if you let it. It ain't about how hard you hit, it's about how hard you can get hit and keep moving forward, how much you can take and keep moving forward. That’s how winning is done! If you know what you're worth, then go out and get what you're worth. But you gotta be willing to take the hits and not pointin' fingers saying you ain’t where you wanna be because of him, or her, or anybody! Cowards do that, and that ain’t you! You’re better than that!" I don't know what else to say on top of that. Like I said earlier, this movie is going to be something that I'm going to be working my mind around for the next few days. Good movies should do that: they're supposed to make you laugh and cry and think a little. Rocky Balboa did all of those things, and more. This may have been the best movie that I saw in all of 2006. And I can't wait to see it at least once more in theaters. ...'cept I came down with the most horrid case of strep throat that I've had in a very long time! And I had the worst of it the next few days: out of Christmas day itself, I only really remember an hour or so of it. The rest of the time I was in bed burning with fever. It was only the following day that I felt well enough to get up and get out some. So, not the best of Christmases this year. But I guess I should be thankful: Lord knows that it could have been worse. I'm glad that I was able to share what I was able to enjoy of it with my family... and I'm thankful that they took care of me. Here's the bulk of the stuff that Lisa and I got. 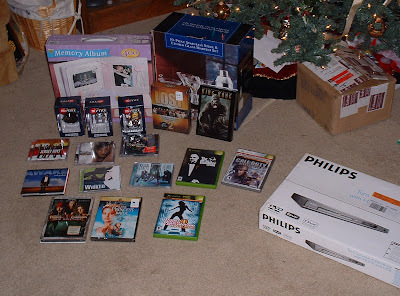 She got a bunch of CDs (including the new one from Taylor Hicks and the soundtrack for Wicked), a scrapbooking set, the most recent edition of Dance Dance Revolution for Xbox and the DVD of Pirates of the Caribbean: Dead Man's Chest. On the DVD front I got Lost Season 2, King Kong Extended Edition and from my in-laws, The Princess Bride: a movie that I had never seen until five years ago and kicked myself for not having seen it earlier and have wanted to get a copy for awhile but never have... now I got one. 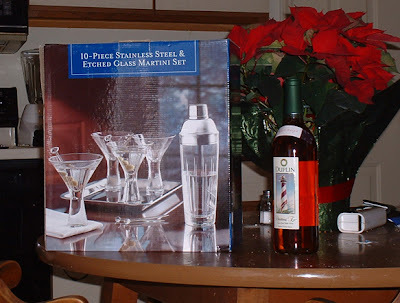 In the pic you can also see the martini set that Lisa got me that I already mentioned getting. For Xbox I got Call of Duty and The Godfather, which was a surprise gift from Lisa and I think I'm going to get addicted to this one in the worst way. There's also the requisite Star Wars gifts (some Chocolate Mpire Christmas tree ornaments including C-3PO and R2-D2). There's also a new DVD player which I'm going to be writing about more later on, that has upconversion for high-def TVs. Last Friday night at my parents' place I got a gift-wrapped box from Dad. When it was opened had a lot of styrofoam packing chips, a card, and this. The card had some money in it but this was the real prize. 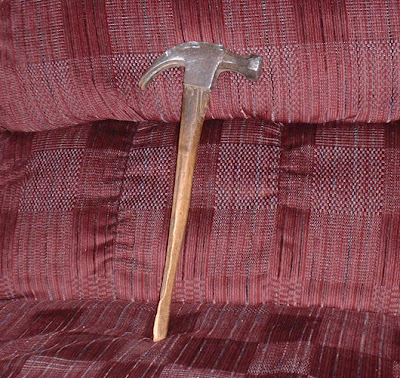 See this old hammer? This belonged to my grandfather. I never knew either of my granddads: they both died before my time and Dad's dad passed away a year and a half before I was born. This is something of his, that is now mine. I can't begin to describe the sense of connection this thing has come to represent. I'm thinking of putting it in a shadow box to mount on the wall. UPDATE 5:12 AM 12-30-2006: I woke up a little bit ago and found that the big news is that Saddam has indeed "danced the Tyburn jig". Here's a pic of the noose going around the former dictator's neck. No doubt we'll be seeing footage of the entire thing on YouTube before the day is out. EDIT 2:36 AM 12-31-2006: I'm only posting this 'cuz it's gotten everywhere already anyway: the cellphone-recorded video of Saddam making "the long drop". 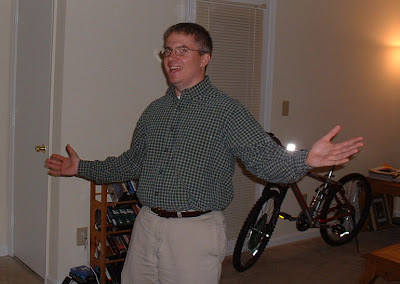 Chad told me you're a regular reader of the blog. Thanks for checking me out dude and hope we can hook up again sometime real soon :-) 'Til then take care and God bless! 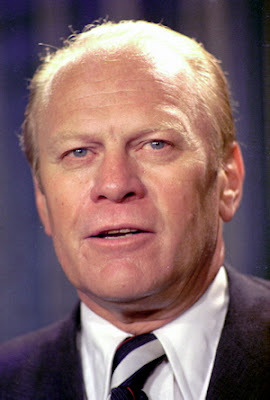 We heard the news early yesterday morning but I'm just now able to note here that in addition to James Brown, we've now also lost Gerald Ford: 38th President of the United States. Who was a lot of other things too, but to me especially Ford will always be remembered as the first (and so far only) Eagle Scout to become President. And without naming any particulars, I'll also add that Gerald Ford was one of the darned few Presidents we've had in the past fifty years who merited respect for the solemnity and virtue that they brought to the office. I don't know if we'll ever see anyone of Ford's nobleness return to the White House anytime soon. Well, I don't know what else can be said, except that a great man has left us. And I thought that it was worth honoring his memory by making a post about it here. 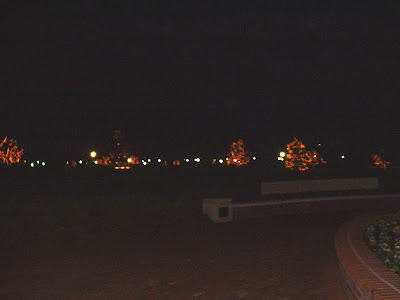 Usually, I wouldn't post something during my Christmas "sabbatical". But hey, James Brown was the man! He made some mistakes in his life (and went to prison a few times for them) but through and through, he was a true son of the South and one of the rare that it could be truly said "he was one of a kind". UPDATE 7:20 A.M. EST: While we're talking tributes to James Brown, here's what Eddie Murphy did to honor the Godfather of Soul back in the day. "Hot Tub!" As has become the usual custom, I'm going to step away from the blog for the next few days to celebrate Christmas with family and friends. This has been a pretty wild past several months, between running for school board and a few other things. I haven't really afforded myself a chance to stop and breathe in all that time. For the next several days, I'm going to treat myself to that, and take the time to contemplate on and admire how far God brought us this past year... and how far He might still take us yet in 2007. So until the next time that I post here, here's wishing you all a Merry Christmas... and a Happy Hannukah to our Jewish brethren. Christmas 2006: Now we'll REALLY have some fun! At the wild WGSR staff Christmas party this morning (which was televised live believe it or not) our boss gave each employee a fine bottle of Christmas red wine. Then earlier this evening Lisa gives me an early Christmas present: a martini set, including glasses and stainless steel mixer. I've been mentioning a "full-length feature film" on this blog for several months now. Earlier this week "Weird" Ed and I decided it was time to reveal what it is we are working on. 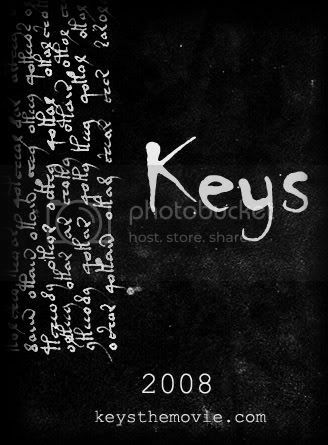 Today, December 22nd 2006, KWerky Productions is proud to announce that our next project is a feature-length movie entitled Keys. Currently I am working on the first draft of the script. If all goes well, we hope to begin shooting sometime early in the summer of 2007, for release in early-mid 2008. Obviously we don't want to give away too much at this point about what Keys is about. We can say that the title has more than one meaning in the context of the story. That this is going to be a film with a fairly definite moral, even though that will be left for the viewer to understand what that moral is. And that we think we may have hit on a pretty neat and original idea for a story. Along with the name of the film, we are also announcing that its official website keysthemovie.com is now open. Admittedly there isn't much there at the moment, but that will change as the months progress. We believe this is going to be a really wonderful project to work on. This is going to be a substantially more ambitious film than Forcery was. When we were producing that movie, we were completely "babes in the woods" when it came to filmmaking. But we learned a lot from the experience. We've had time to study what we did right, what we did wrong, and the art of filmmaking in far greater depth than we've been able to before. We've made a few shorter films since then. We're now confident that we are ready to try something a little more bold. And we are looking forward to working with some of the same terrific people that were part of our time on Forcery... as well as finding some new faces to share the experience with. We will also be attempting something with Keys that, to the best of our knowledge, has only been done once or twice before. It's something a bit revolutionary. For a lot of reasons, we are really looking forward to pulling this off. And if I say any more, I'm most likely going to let something slip that I probably need to keep under wraps for the time being. But anyway, there you have it: Keys is our next film project, it's a full-length movie, and we will be completely pulling out the stops on this one. There's one scene in particular that I just can't wait to shoot! Keep an eye on the official Keys website in the next few months as this project really gets cranked up. Following two weeks of some of the most forgettable Doctor Who episodes ever - last week's "Fear Her" and before that the abomination called "Love & Monsters" - the show returns to fine form tonight with the final two episodes of the revived series's Season 2 tonight at 8 p.m. on the Sci-Fi Channel. I'm forgoing the usual "sneak peek" with "Army of Ghosts" and "Doomsday", because the less you know of these two episodes before going into them... well, the better. This two-part story ranks alongside last season's "The Empty Child"/"The Doctor Dances" as some of the best Doctor Who storytelling since the show started up again: yes it's that good! Keep the Kleenex handy, especially toward the end of "Doomsday". And if you have a good Internet connection be prepared to find and download "The Runaway Bride", this year's Doctor Who Christmas special, sometime after it runs on the BBC in Great Britain on Monday. The full website won't be up for another few weeks, but I thought it would be neat to make a pre-Christmas announcement about it. There will be more information about Knight Vision Media coming soon. There's one other thing that we've decided it's time to pull the veil off of (no Lisa and I aren't having a baby... yet). Expect another announcement within the next 24 hours. Book 7 is HARRY POTTER AND THE DEATHLY HALLOWS! Funny thing: I've had this feeling for the past two weeks that we would be getting the title of the seventh and last Harry Potter book before Christmas. And I was right. Harry Potter and the Deathly Hallows is the title, according to J.K. Rowling's official website. Mounting rumor is that this final chapter of the Harry Potter saga... and maybe even for Harry himself... will be released on July 7th, 2007: Book 7 on 7/7/07. This is the most I've struggled with writing a review in quite a long time, made all the more worse because I'm a big fan of Orson Scott Card: Ender's Game and Speaker for the Dead were two of the books that influenced me the most when I was in high school. I also think that Card is a brilliant thinker when it comes to things like domestic politics and foreign policy, as evidenced by his weekly writings in the local The Rhinoceros Times newspaper. So when I first heard about his new novel Empire – which depicts a near-future civil war breaking out between the "Red" and "Blue" states along polarized party lines – I was most eager to read it. So let me get straight to the point: I didn't like Empire. To be curt: This Empire strikes out. Empire is one of the most frustrating novels I've read in a very good while. For the first time ever, I had to force myself to reach the end of an Orson Scott Card novel, instead of plowing through it like a madman. Speaker for the Dead completely train-wrecked a Spanish class I took in high school 'cuz I couldn't stop reading that book instead of conjugating verbs. With Empire I got bored, put down the book, made myself pick it up again 'cuz I’d already said here on the blog that I wanted to read it, dropped it once more then figured I might as well go ahead and get this over with. It's a book so rife with problems that I honestly don't know where to begin, but here follows a few. For one thing, Empire is a maddening mélange of milieus. Empire is written like Tom Clancy attempting a Left Behind-style hack job while channeling Michael Stackpole doing a Battletech novel... with sponsorship by People for a New American Century. And something about that: Empire could easily be accused of being a blatant ripoff of the Battletech/Mechwarrior saga set in the modern day. That was the most jarring thing that shook my belief in Empire: in this supposedly near-future setting, the Progressive Restoration forces are using BattleMechs straight out of Mechwarrior and riding around on motorcycle-hovercrafts. Hell, they even have Elementals fighting for them! If that one component of the story had been stripped out, I might have been inclined to look on Empire with a much more forgiving eye. But seeing as how Empire was originally conceived to be the setting of a computer game, I can only assume that the inclusion of such high-tech anachronisms came about because of a "Toys, toys, toys!" mindset to increase this story's marketability. At other times in Empire, it's pretty apparent that Card is drawing inspiration from the TV show 24 (which he admits being a fan of in the novel's acknowledgements). That's not necessarily a bad thing, but trying to throw 24's sense of suspense in this jumble of genres really doesn't help matters. Worse: far more often than not, Empire seems too much like neo-conservative propaganda. Fox News, Bill O'Reilly and the never-named Republican President who was elected in 2000 are without exception depicted as being "the good guys", while the villainous Progressive Restoration movement is obviously supposed to be radical liberal extremists led by a thinly-veiled caricature of leftist bugaboo George Soros. In addition, Empire notes quite a lot of disapproval of the Democrat presidential candidate, who is always referred to as a female... hmmm wonder who that could be. Which I think that a Hillary Clinton presidency would be an even bigger disaster than the George W. Bush one has been, but beating the reader's head with the writer's political preferences like this does not add any more appeal to the story and in fact detracts from it. The "civil war" that's advertised as being depicted in Empire is really a misnomer: a real civil war is when entire populations of a country gather around regional or ethnic similarities and engage in total conflict with each other. The American Civil War was a real civil war. The Korean and Vietnam conflicts were civil wars. What happened in Yugoslavia in the 1990s was a civil war. Rwanda in 1994 was a civil war. Iraq is NOT yet a full-blown civil war. At the moment most of the fighting there is because of a number of fringe extremists... but we are definitely seeing that country split along pre-World War I lines enough that it's now more than likely that we will see a full-bore war between the Sunni, Shiite and Kurdish populations in the near future. When that happens, the U.S. would do well to pull out because there is nothing we will be able to do to stabilize Iraq as a singular nation at that point... but I digress. As I was saying, the "civil war" in Empire is really a well-funded guerilla campaign launched against the federal government by the "Progressive Restoration" movement. There are some state governments that choose to side with the Progressives, but in no way is there anything like "brother against brother" going on here. The Progressives, for all their military hardware, are actually a very small organization compared to the might of the federal government and the various state National Guard units. So if you think that you're going to find neighbor shooting neighbor because one of them has a "W" sticker on his car, you'll be disappointed to know that nothing like that happens here. Too many parts of Empire's plot stretch credibility past the breaking point. I mean, using a high-school protractor to calculate a missile vector aimed at the White House after just crawling out of the Potomac? 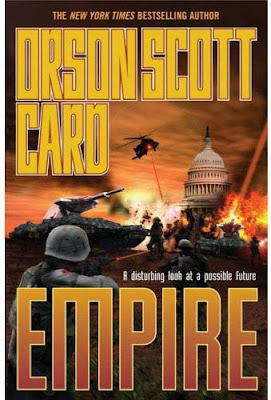 But what disappoints me about Empire most of all is this: Orson Scott Card is a pretty smart guy. I'm inclined to believe he's got a lot more astute wisdom than a lot of people do. He barely uses that in Empire. And I was so sure that he would have been wise enough to understand that the only real way out of this mad game between the conservatives and liberals, between the Democrats and Republicans... is to choose not to play the game at all. Orson Scott Card seemed so apparently set to address, with the considerable weight of the respect that he's earned, the Gordian Knot that is modern American politics. It cannot be untied. The only way to solve the problem is to slice through it. Card squandered the opportunity here to at least tell people which drawer holds the cutlery. With Empire, Orson Scott Card had a real chance to stand aloof from the insanity of the two-party mindset and thoroughly condemn it from his perch. He could have been seen as a leader with real ideas, much as the academic Averell Torrent – the one character I really liked – is divorced from being a slave to either the Democrat or Republican parties. But instead of ideas, Empire is ultimately a book that reinforces ideologies. Empire attacks the parties only superficially, without addressing the real cause of so much grief in this country: that both parties are interested only in raw, naked power... and will do whatever it takes to acquire that power, to hell with consideration of the individual or God-given rights. So help me, I really cannot begin to describe how disappointed I am with this book. I feel like I've barely touched on most of the problems with Empire. I still don't know how to address them all. Well, anyway, there it is: I can't recommend Empire. And I hate that I can't do that. You're supposed to come away from reading a book with either a sense of fulfillment or a sense of being challenged on some level, and Empire did none of those things. I gained nothing by reading this book and I don't know how most people could finish this book with any real sense of having grown from the experience. In short: Empire is a very lackluster read from a very wonderful author. But hey, we can't hit the basket EVERY time we shoot, right? 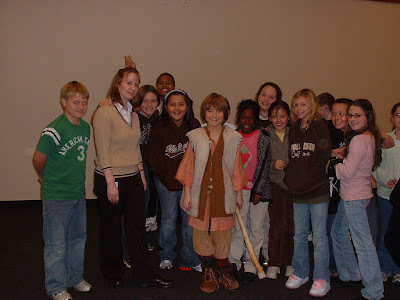 Yesterday morning I went along as a chaperone with Lisa's students on a field trip to see the Music and Drama departments from the University of North Carolina at Greensboro put on a performance of the Christmas opera Amahl and the Night Visitors. We had to drive to Westover Church's new sanctuary (which is absolutely cavernous) because Aycock Auditorium on the UNCG campus - where stuff like usually gets performed - is undergoing renovation. Anyway, here's a few of the pics I took while we were there. I must say that I really enjoyed the program... although it seemed awful short for an opera (only an hour or so). But I suppose this really is a performance meant for people of all ages to be able to enjoy: I mean, you can't expect little kids to sit still all the way through The Marriage of Figaro can ya? Anyways, excellent job by the good people in the UNCG Music and Drama departments! CIVIL WAR: "Whose side are YOU on?" Are you with Snow Miser? Or are you with his brother Heat Miser? Both clips are from the classic Christmas special The Year Without A Santa Claus (the ORIGINAL one, not the new live-action remake with John Goodman as Santa, Delta Burke as Mrs. Claus and Harvey Fierstein (?!) as Heat Miser). ...I've watched this trailer about ten times now. And I like it a lot! Seeing this first trailer for Transformers, I am realizing for the first time that the Transformers that I knew and loved in my younger days, just wouldn't work with modern cinema. Say what you will of Michael Bay: it really looks like he's on track to have updated the whole concept of the Transformers, made them something very dark and menacing and real. These Transformers, the ones I'm seeing in this trailer, are far more like the alien organisms that they are supposed to be than how they were ever depicted in the comic books or cartoons... with an emphasis on "alien". Good golly... I'm actually starting to look forward to seeing Transformers now! Mash down here for the first trailer for Transformers, either in regular Quicktime or Windows Media, or in Quicktime HD! 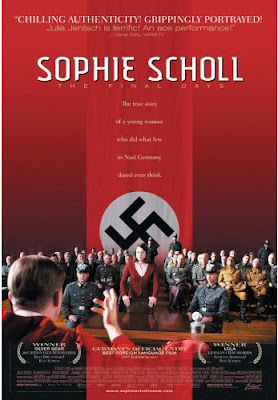 Three months ago, I posted on this blog a review of the movie Sophie Scholl: The Final Days. Ever since I heard about this movie earlier this year (it's actually a German-produced film originally titled Sophie Scholl - Die letzten Tage) I had been looking for any chance at all to watch it. Sophie Scholl: The Final Days is the story of Sophie Scholl, a 21-year old university student in Munich, Germany in 1943. At the height of the Nazi regime, Sophie, her brother Hans, their friend Christoph Probst, and a few other conspirators produced "The White Rose" pamphlets: a series of six leaflets condemning Nazism and calling for an end to the war. On February 18 1943, Sophie and Hans were arrested after being caught disseminating the pamphlets at the University of Munich. Shortly thereafter Christoph was taken into custody. The three were given a "show trial" a few days later and a few hours after that on February 21st, the three friends were guillotined. In the decades since World War II, the members of the White Rose have become a symbol of courage and resistance to the young people of Germany and others throughout the world. Especially Sophie Scholl, who is seen by many to not only be a hero, but a Christian martyr who laid down her life for her beliefs. The story of the White Rose has haunted and fascinated me ever since I first read about them when I was working on my history degree. There have been other movies about the White Rose produced over the years. But when I heard that Sophie Scholl: The Final Days was not only focusing on Sophie and her Christian faith, but also that it was using recently-uncovered official documents from the arrests and trial of the White Rose members, I became hellbent on seeing it one way or another. Alas, no theater around here ever showed it. But someone heard about my plight and arranged for a bootleg DVD to be sent to me. I finally got to watch Sophie Scholl: The Final Days and you can read my initial thoughts here. But it was a less-than-stellar version of the film in terms of image quality... to say nothing of how mangled the English subtitling was (I'm still laughing at how the three friends were on trial for "sabotaging nuclear power plants" in 1943 Germany). I told Lisa in September that I wanted her to watch this movie, but only after we had the official DVD release. Well, the week before last a package from Amazon.com came and among other things, there was the DVD of Sophie Scholl: The Final Days. Lisa and I watched it together Sunday night before last. She had never heard of the White Rose or Sophie Scholl before then. The movie haunted her: "It's been stuck in my head" she told me a few days later. Seeing it again was no less powerful for me either: this is an excellent DVD and the transfer is incredibly beautiful, even being a standard-def DVD playing on a high-definition set. Side 1 is the actual movie, presented in 16:9 aspect ratio. 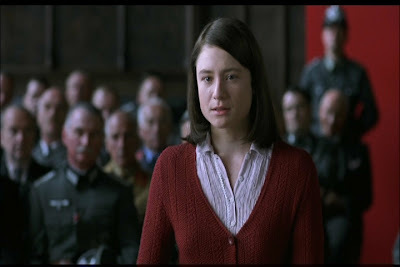 You have the option of watching it with or without English subtitles (since neither one of us speak German, we thought it a good idea to turn subtitles on :-) Here you see Julia Jentsch in the role of Sophie Scholl, as she's on trial. This is the scene that pits the two real powerhouse performances of Sophie Scholl: The Final Days against each other: Jentsch as Sophie, and André Hennicke as presiding judge Roland Freisler... also known as "the Blood Judge". Every word of the exchange between Freisler and the three defendants is taken from the actual trial transcripts that just came to see the light of day in the past few years: nothing you see in this scene was made up. The scenes of Sophie sharing her prison cell with Else Gebel (played by Johanna Gastdorf) were taken from recollections given by Gebel after the war. So too were the interrogations of Sophie by Gestapo agent Robert Mohr (Gerald Alexander Held) based on the actual notes of the debriefing sessions. In fact, I would say it's safe to say that of all the movies I've ever seen about Nazi Germany and the Holocaust, Sophie Scholl: The Final Days may be the one that went to the most painstaking lengths to be as accurate as possible to what really happened. Side 2 of the disc is the extra features, and if you are a history buff then you will be absolutely stunned at the material that's been brought together for this added content. "The Making of Sophie Scholl" is an hour-long documentary about the movie's production, covering various aspects and scenes and how the producers labored to make the film as close to historical fact as it could possibly be. There are thirteen deleted scenes on the Sophie Scholl: The Final Days DVD, which is considerably more than how many are on the DVDs of most American movies. Several of these scenes are extended sequences during the trial, showing a lot more of the time when Hans, Christoph and Sophie were on the stand before Freisler. There is also quite a lot more of Hans and Sophie's parents as they tried to get into the trial to protest for their children's lives. And then there is the historical material: interviews with Mohr's son, Hans and Sophie's sister, and one with Sophie's cell-mate Else Gebel herself. The really scary material is actual footage - with sound - of a trial being presided over by "Blood Judge" Roland Freisler. This may be the first DVD I've ever owned that had the voice of absolute evil recorded on it. For almost ten years I've read and studied everything that I possibly could about the White Rose. I'm pretty sure that I've seen almost every photograph related to the conspirators and their eventual capture and executions. After their trial Hans, Sophie and Christoph were taken to Munich-Stadelheim Prison and a few hours later they were executed on the fallbeil (the German version of the guillotine: it featured a much heavier blade that made up for the shorter distance that it fell as opposed to the traditional French version). I've seen photographs of the execution room at Munich-Stadelheim, which showed the guillotine and the rod hanging from the ceiling from which some victims were hanged (their deaths being caught on motion picture cameras so that Hitler could later watch the footage of them squirming in agony). Take a look at this shot from toward the end of Sophie Scholl: The Final Days: The man standing next to the guillotine is meant to be Johann Reichhart, who carried out more than 3,000 executions during his long career. Toward the right is the ceiling rod using in hangings. 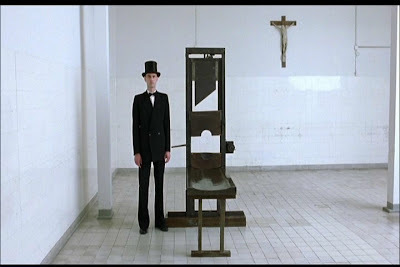 And then there is the guillotine itself, dominating the shot. When I first saw this I was absolutely shocked, because I thought to myself "Dear Lord... that looks EXACTLY like the real guillotine that was at Munich-Stadelheim". ...Because it IS the guillotine that was actually used at Munich-Stadelheim! This comes out during the entire section devoted to the guillotine that is in the making-of documentary on Side 2. 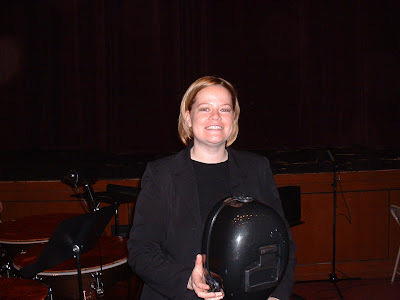 At one point Julia Jentsch comments about how this is the same bucket she is looking into when she's on the guillotine that was the last thing that the real Sophie Scholl saw before she was killed. Jentsch talks about how overwhelming an experience it was to be in that machine, knowing this is the very one that beheaded Sophie and Hans and Christoph and hundreds more when it was in use. 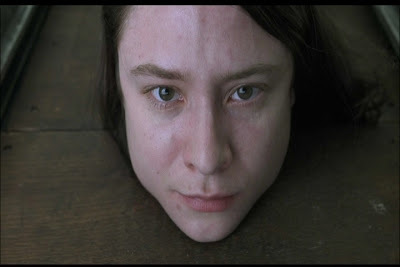 So when you see this scene right at the end... ...bear in mind that this is where the REAL Sophie Scholl's head was before the blade fell. Even if I had never known that, I would still be in awe at this movie: at the powerful story of courage and bold faith that it depicts and to the lengths that the filmmakers went to in making it as honest to what really happened as could possibly be expected from a movie. I said this in my original review: Sophie Scholl: The Final Days is a movie that should be seen by high school history classes and church youth groups everywhere. There is so much to be conveyed from this wonderful film to people, and especially to young people. Teachers should definitely consider getting this for class viewing and discussion. It may not be available at your local Best Buy or Circuit City, but Sophie Scholl: The Final Days is a DVD wonderful enough to be well worth tracking down either on Amazon or elsewhere. I cannot begin to describe how much I would suggest this DVD to others. Highly recommended! Apparently Rocky Balboa - which premieres in theaters tomorrow - references ever single previous Rocky movie... except Rocky V. Sylvester Stallone is now being quoted in a few places as saying the reason he wanted to make Rocky Balboa was to make people forget about how bad Rocky V was. In other words, as of this week, it's possible that Rocky V should no longer be considered part of Rocky continuity at all. Remember a few months back when Superman Returns came out, and how it "wiped out" the third and fourth Superman movies from "really" happening? Now the same thing is happening to the Rocky saga: the biggest mistakes are being erased. They're being eliminated by "retroactive continuity", AKA "retconning". And I think it's terrific! In hindsight, there are a lot of movie series, that were otherwise brilliant before getting tarnished by mediocre sequels, that could be getting this treatment. 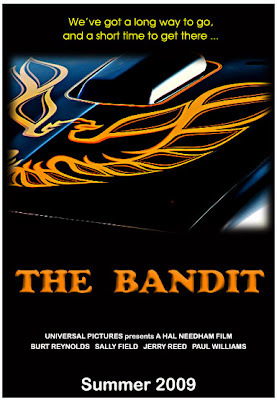 F'rinstance: Burt Reynolds should play the Bandit one more time... and play him throughout the movie this time... in one final installment that makes us forget that the series ended with Smokey and the Bandit Part 3... Then there's this possibility that comes to mind... King Conan: Crown of Iron was an actual movie project about five years ago. John Milius had written the script and was set to direct it, with production by the Wachowski Brothers (of The Matrix fame). I was able to read the script in 2003 and it was one of the most beautiful and brutal screenplays I've ever found... and it ties in perfectly with the original Conan the Barbarian, like the scene where he's again praying to Crom. 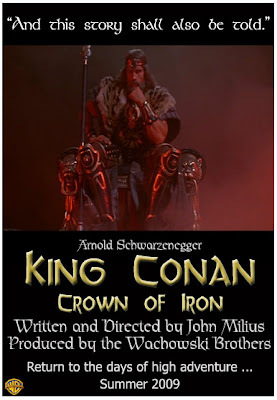 Had it been produced, King Conan: Crown of Iron would have made us all forget that Conan the Destroyer ever happened. Sadly, with Arnold Schwarzenegger now in politics (with no signs of returning to acting), and now that both Mako and Basil Poledouris have passed away, this one doesn't stand much chance of ever getting made. But it would have been a wonderful thing to have been able to behold. And then, there is this: the movie series that I think most deserves, if not outright screaming for, a chance for a make-over... Alien 3 went through something like 40 writers: that should tell you how big a mess the movie was even if you've never seen it. Alien Resurrection had moments of pure genius, like when the queen is giving birth with a human reproductive system (and it didn't hurt to have Ron Perlman in it either). Otherwise, it really didn't resonate along with the first two entries in the Alien series. In my mind at least, the last thing we saw of canon story from the Alien saga was Ripley and Newt and Hicks and Bishop turning-in for the long journey back home. I believe they're still en route to Earth and whatever happened in Alien 3 and Alien Resurrection are just bad dreams that Ripley is having while in hypersleep... if even that. 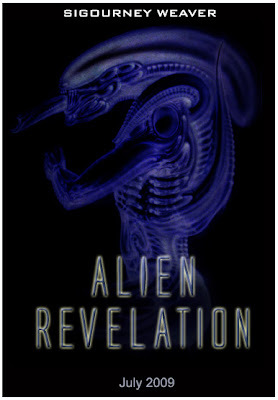 There needs to be a new Alien movie: one that completely repudiates the events of the third and fourth installments. Heck, William Gibson wrote an awesome script for Alien 3 almost twenty years ago and it was never used: why not just adapt that and set the story 20 years later after the Sulaco returned to Earth? Actually, I would love to see the alien be brought to Earth and start multiplying, and an older/more world-weary Ripley get called back to help eliminate the creatures. Even if Sigourney Weaver wouldn't agree to return to the role of Ripley, I think a top-quality Alien story that picks up the story from the end of Aliens would definitely be appreciated, so long as it does away with Alien 3 and Alien Resurrection. There's probably more movie series that would benefit from the treatment that the Superman, and now Rocky sagas are getting. In the long term scheme of things, this might be the one strategy that will ensure that these movie series would still be discovered and enjoyed by future generations, instead of writing them off wholesale because of lackluster sequels. On December 19th 1971, filmmaker Stanley Kubrick unleashed what – I believe so anyway – is the greatest movie he ever made. So let's hoist our glasses and raise a toast to the 35th anniversary of A Clockwork Orange! This is definitely my most favorite movie that Kubrick made: even more so than 2001: A Space Odyssey and Dr. Strangelove (although I love those also quite a bit). But none of his other works have had the influence on my life as A Clockwork Orange has. So how did I wind up coming across it? I'd heard of A Clockwork Orange for years and thought it an oddball title but didn't have any inclination toward watching it, until one day in English class during my high school senior year a classmate talked about seeing it the previous weekend. 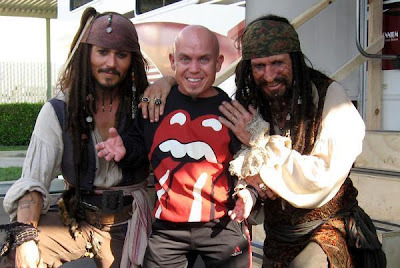 "That's the most torn-up movie ever made," Joel told us. That was all it took: not long after I went into Action Video and rented it. To a seventeen-year old mind that had wound up staying fairly pure so far as cinema brutality went, A Clockwork Orange was like being splashed in the face with a bucket of warm blood. To say that I was "shocked" would be a vast understatement. Since then I've probably watched A Clockwork Orange two or three dozen times over the years. Sometimes alone and sometimes, it's been watching it with other people just to see their reaction to it and what they think it's about. My first year at Elon, I kept telling my friends Gary and "Weird" Ed that they should check this movie out. So one Thursday night they came over to the apartment for pizza and I put A Clockwork Orange in the VCR. It had a strange effect on Gary: the entire time we drove back to campus he kept repeating the word "kill" over and over again. After watching it with another friend, he found himself addicted to speaking "Nadsat" (the weird mixture of Russian and English that Alex and his gang uses when they talk). I showed it to Lisa a few months after we'd started dating... which probably wasn't the smartest thing in the world considering I was trying to keep this girl, not scare her off. She didn't think I was a pervert for liking this movie, but I don't think she's ever wanted to see it again either. 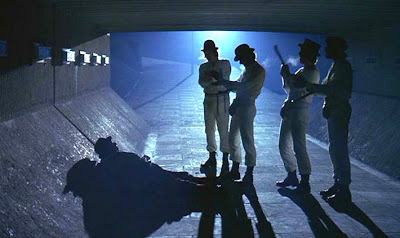 But that's understandable: Even after all this time, A Clockwork Orange still barrages my own senses every time I see it. I don't think that "torn-up" is really the right adjective to describe A Clockwork Orange anymore though. "Torn-up" would be a movie that's bizarrely violent for violence's sake, and that's not A Clockwork Orange at all. Neither is it a very complex tale: it's actually a pretty simple story. Alex DeLarge (Malcolm McDowell) is the young leader of a gang of remorseless hoodlums in an England sometime in the future (we are never told when exactly this story takes place). Life for Alex and his gang means drinking milk laced with drugs before heading out into the night for "a bit of the old ultra-violence". This usually means stealing cars, kicking the crap out of defenseless old men and forcing a husband to watch as his wife is gang-raped. One night one of Alex's pranks on innocent people results in the death of a woman and he's left wounded at the scene after being betrayed by his gang members. He's arrested, put on trial and sentenced to prison. He spends a few years behind bars and then comes to the attention of the government. 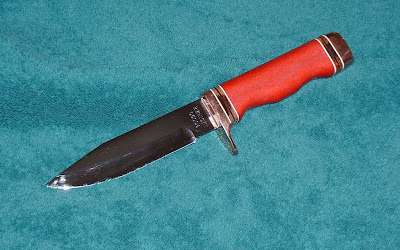 Alex, it seems, is the perfect subject on whom to test "the Ludovico technique": a psychological procedure that renders the person incapable of wanting to commit acts of violence. I won't say anymore than that, to keep the story from being "spoiled" for those who haven't seen it yet. But in spite of the unbridled violence that permeates A Clockwork Orange, I've never found that to be the focus of the film. The story of Alex, and what he goes through and what is done to him, vastly outweighs and even justifies the visual trauma that is inflicted upon the viewer of this movie. And from the very beginning, every time I finish watching A Clockwork Orange it's not the violence that occupies my mind... but a sense of sympathy for Alex and what he's gone through. What A Clockwork Orange has meant to me has changed considerably over the years. When I first saw it, I saw it simply as a movie about youth out of control, and then youth wasted without purpose. Today my understanding of it is much more profound. The most central theme of A Clockwork Orange is moral choice: Can a person be made to be good, or is being good something that he or she must choose on their own? In that regard, A Clockwork Orange stands as an indictment against those who believe that it is the role of the State to create morality. A conscience is something that a person must want to have. It cannot be initiated or even nurtured by government if it's already there, because that would either corrupt a man at best or completely destroy him at worst. As we see in A Clockwork Orange, the government's meddling in things best left to God almost results in Alex being killed. In recent years I've come to see a theme in A Clockwork Orange about how in spite of the "morality" it tries to enforce, that government – no matter who is running it – really doesn't care about the life of the individual. To the state, individuals are mere tools to be used at whim to maintain the state's hold on power. The government in A Clockwork Orange does not really care about what happens to Alex in the long run: they want results now that will impress the voters enough to keep their party in office. Which it doesn't matter if that party is "liberal" or "conservative": to either, Alex would be an expendable asset. I think this kind of commentary about the dehumanizing of the individual for sake of the political party was way ahead of its time in 1971... and something we would do wise to consider today. 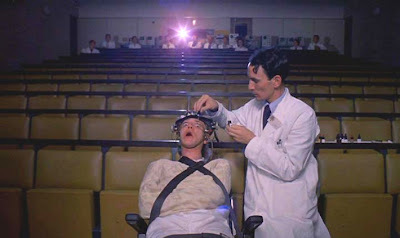 As a Christian, I have also come to see A Clockwork Orange as being about what the world is like without the virtues of grace and forgiveness. Alex finds that out after he's released from prison and discovers that though the state may have forgiven him on paper, his victims did not. Alex's sins come back to haunt him and when they catch up with him, they are unrelentingly cruel and vicious... just as Alex had been before being sent to prison. I can't help but think to myself "This is how the world really is without the willingness to return love for hate". If you want to get a glimpse of what a world devoid of God is really like, go watch A Clockwork Orange. And I don't think that I'm seeing too much in this story so far as Christian metaphor goes either considering that Anthony Burgess, the author of the original novel, was a devout Christian himself. Well, I could go on, but to do a really full analysis of A Clockwork Orange would take probably another fifteen pages, so I'm just going to leave it at this. 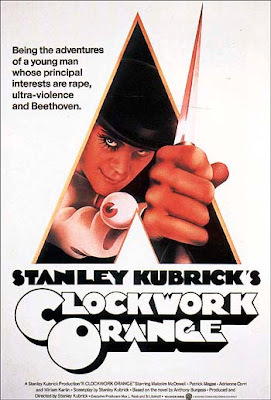 So in honor of this, the 35th birthday of Stanley Kubrick's A Clockwork Orange, I suggest that a celebration is in order: Either watching the DVD of the movie or if there's no time for that, at least listening to a bit of Beethoven's Ninth Symphony. 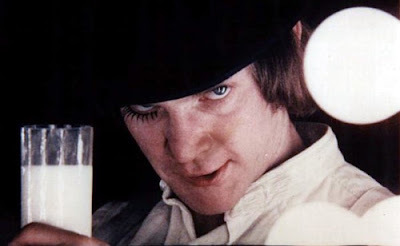 However it is that one chooses to commemorate it: happy anniversary A Clockwork Orange! A book review, a DVD review, maybe a movie review, another humor piece, possibly more YouTube videos, a holiday tradition, and an announcement. All of this before the week is out. "I liked the part where Darth Vader rides the Balrog." The point where I started giggling during the movie Eragon was when the namesake character (Edward Speleers) is standing outside the farmhouse at dusk and wistfully looking at the setting sun. They should have just went ahead and made it a dual sunset and gotten it over with, because Eragon is not just kinda like Star Wars Episode IV: A New Hope... IT IS STAR WARS EPISODE IV! ...It was so bad that when Eragon is trying to rescue Lei... I mean Arya (Sienna Guillory) I was almost expecting him to plop on an Imperial Stormtrooper helmet before walking into the place. Oh yeah, the burning homestead with the dead uncle: that's in Eragon too. So is the trip into – and daring escape out of – Mos Eisley. The plot may have been ripped-off from Star Wars Episode IV but a lot of the visual elements seem to have been at least partly inspired by The Lord of the Rings movies. There are these guys, I think they're called Ogres in the movie – there are also evil beings called Rajas and Urkels – but they look too much like the Orcs from Peter Jackson's trilogy. There's also this entire horde of big bald guys, I don't know what they’re supposed to be. And then there's that thing that Darza (who's something called a "Shade" and is played by Robert Carlyle made up to look like the moldering corpse of Lucius Malfoy from the Harry Potter movies) is riding on. It looks so much like the Balrog from The Fellowship of the Ring that all that was missing was Gandalf screaming "YOU SHALL NOT PASS!" The effects were great. Not the best I've seen though. 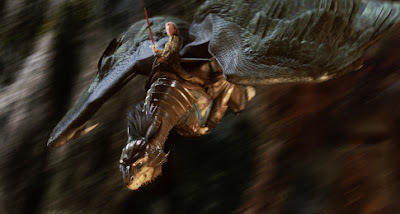 So far as onscreen dragons go the Hungarian Horntail from last year's Harry Potter and the Goblet of Fire felt more convincing than Saphira (voiced by Rachel Weisz... which to me sounded way too sweet for a dragon) does here. The thing that I liked most about Eragon was Jeremy Irons. Which Jeremy Irons is one of my all-time favorite actors anyway, so maybe I'm being biased. But here in Eragon Irons is doing his darned bloody best to convince us that not only is his character Brom real, but so is this world around him. Brom was my very favorite character in Eragon. And Jeremy Irons is really good here, even when he's forced to speak dialogue that sounds more like something out of Krull or Yor: Hunter from the Future or one of those other Eighties-era fantasy flicks than from a best-selling novel of the early 21st Century. No, I haven't actually read the novel, although plenty of people – including Lisa and "Weird" Ed – have told me that I should. I did start reading Christopher Paolini's book several months ago but couldn't get past the first few chapters: think I only got as far as Eragon getting tutored by Brom about the history of the Dragon Riders. I was so occupied with the school board campaign the past few months that time for pleasurable reading was very hard to come by. At the time I really did find it to be a pretty hard book to find very appealing... but maybe I'll give Eragon the book another chance. And perhaps after that the movie will be a lot more fun to watch. So... did I actually like Eragon the movie? It was an okay way to spend a Sunday afternoon. But I wasn't overwhelmed nearly as much as I would have hoped. I'm not going to say I was completely "underwhelmed" by Eragon either, though. It was nothing like a Star Wars or Harry Potter movie, but I don't regret seeing it, even though I just wish that I could have enjoyed it more and especially for feeling like there was something here that I hadn't already seen before. Unfortunately, Eragon was way too predictable. But for a movie that I was constantly snickering at, I have to say that I'm compelled to give Eragon another chance to win me over. Which is something that I normally wouldn't do for a movie like this. And the only reason I'm going to give that much grace to Eragon is because of that very last scene in the movie, when Galbatorix the evil king (played by John Malkovich) slashes the giant map with his sword and what we see behind it. That final scene shows a LOT of promise. For that reason alone would I not only try to watch Eragon again, but I would even say that I hope this merits a sequel. It would have to be one heckuva good second chapter though, to make this adaptation of the first installment from Paolini's "Inheritance Trilogy" worth watching again in the years to come. I sincerely hope that the producers of this film can pull that off. 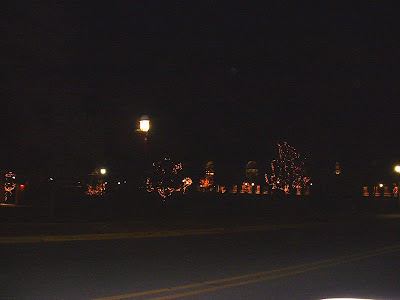 Late Thursday night/early Friday morning Lisa and I were driving back home from Raleigh after seeing Trans-Siberian Orchestra in concert. 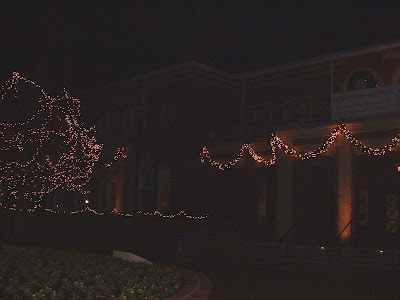 We wound up going through Elon University, where I went to college. 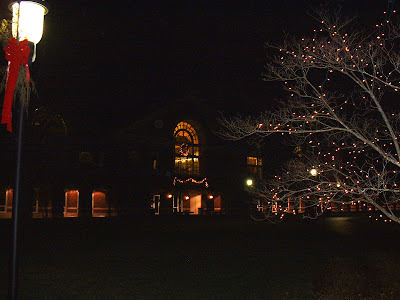 I stopped and took a few pictures, although they really can't do any justice to how beautiful the campus is lit up every Christmas season. 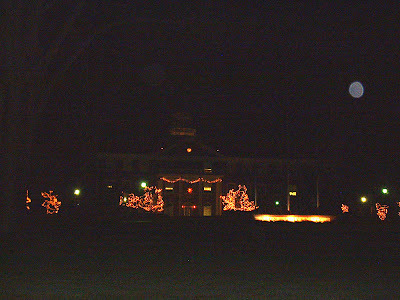 These photos of Elon University were taken around 12:40 a.m. EST on December 15th, 2006. Last night Lisa and I hooked up with Chad and my sister Anita at Chad's apartment in Raleigh. 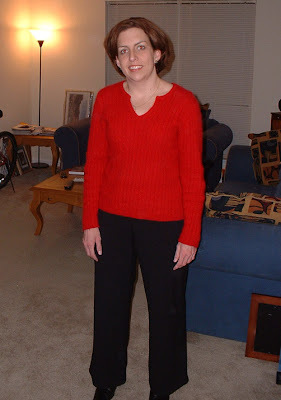 We headed out a little after 6, had a bite to eat at a nearby Quizno's and then headed to the RBC Center for a live concert by Trans-Siberian Orchestra. This was by far one of the most unique musical experiences I've ever had... to say nothing about it being the most lively Christmas concert I've ever attended! Trans-Siberian Orchestra does an amazing job doing a live concert along with various lights and sound effects (we were sitting toward the back and I still feel partially blinded by those huge flames). The first half of the show was the "story" part, where Trans-Siberian Orchestra uses music along with live narration to tell a story: in this case, it's about an angel and these other characters who converge in a bar in New York City one night at Christmas (this tale reminded me a lot about "World's End", the story from toward the end of The Sandman comic's run). The music accompanying this story was from Trans-Siberian Orchestra's The Lost Christmas Eve album. It was a VERY beautiful little show... but that was just the first half. 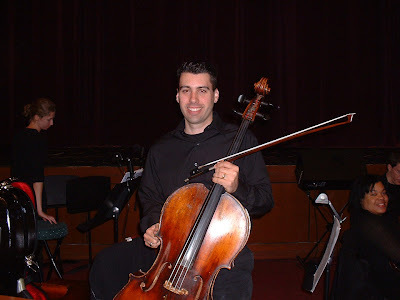 Without any real intermission, Trans-Siberian Orchestra went into the second part of the show after some quick introductions of band members. This time they did stuff like "Carmina Burana" (the COOLEST rendition of that piece I've ever heard), their take on "Layla" by Eric Clapton, and "Christmas Canon" which has sort of become their signature piece in the past few years though this one had no children singing in but that was okay. Toward the end of the show they had a "dueling keyboards" thing between two of their keyboardists and the whole crowd went nuts when one of them started playing the "Linus and Lucy" theme from A Charlie Brown Christmas, before the band wrapped up the show with a spectacular medley of stuff. All told it was an AWESOME two and a half hours! 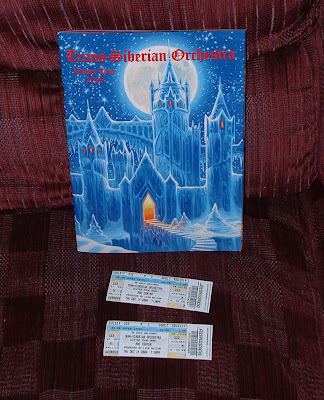 Trans-Siberian Orchestra is definitely worth seeing if they ever do a show near you (but do your best to get tickets early 'cuz they go fast). Were the average person to walk into a bank, declare he had no money, prospects, or experience, then ask to be put on the bank's board of directors at $80,000 a year since he was down on his luck, he would be ushered out the door in short order. But when your name is Bush, your granddaddy was senator from Connecticut, your Father is Vice President or president, "somebody," people in the class structure will work to find a soft spot for you. In Bush's case he was rescued from virtual backruptcy and from a slide into lower-class obscurity by being given a series of such positions until the class structure could install him as governor and eventually president on the basis of family name and class group membership. From the standpoint of outside objective reality, there was no basis in experience or qualifications other than the name Bush, and class union membership, to put him into office as anything --either in business or government. The Bush case is illustrative of principle, not exhaustive. Close examanation of many high level people in politics/goverment reveals a similar path which has a death grip on the American political/administrative system and which often does not incorporate serious employment or evidence of ability along the line. Al Gore is basically an unemployable ludicrous figure saved by inheritance of the Gore family name and state power structure. The same is true of any Kennedy. The list of such people reveals they have no personal investment in anything other than a diamyo class power system and political power mediated by a vacuous loquaciousness that could be found in any high school debate team along with equivalent high school experience and other qualifications. While there may be some jostling between class members for specific positions, as long as the contests are primarily restricted to being among class members, the class system dominence is protected and perpetuated. As I said it's a long read, but one well worth recommending to others. Look for my favorite YouTuber Geriatric1927 (AKA Peter the British pensioner) sporting a nifty Santa hat! 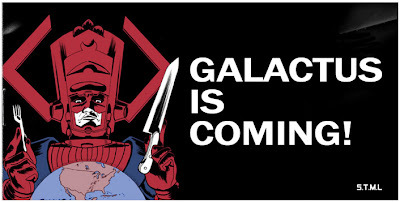 Jack Chick and Stan Lee present: GALACTUS IS COMING! I've a horrible desire now to print up a bunch of these and plant them around our church sanctuary before service on Sunday morning.